Tracking live to my Presto full track tape machine and overdubbing by transferring from a second machine back to the Presto, we cut the whole thing in my basement studio Audio Lab on August 1, 1968. I was quite disappointed that I didn’t get to make their ‘real’ record… I wasn’t famous enough and instead it got produced and finished by people who didn’t care. At the exhibition I complained to Russ Booth’s father (who was an executive or owner of Jenkins music) about how difficult the music business was in Kansas City. His advice: Go to the coast! I left for the Los Angeles the next month. Enjoy this bit of Kansas City music history…..
And Russ was my friend and fellow bass player. Before I left for the coast, I lived in the big red Victorian house that the Mystics left behind when THEY moved to the coast. I have some more material to post soon, from the same players but a different band name. Bob Sebbo was my brother in law back in the late 60’s, married my beautiful sis Deb Finneran. He was the love of her life, but marriage didn’t last long. Have wonderful memories of Deb draggin’ me (her lil’ sis)around to concerts that the band opened for like…. Iron Butterfly, Jefferson Starship back in the day in good ol’ KC. Great memories!!! Barncard you dog! I just stumbled upon this wacky sh#t…OUCH……. Bob, hey Bob, knock-knock, Bob, hey…hellllllo? Is Bob there? What about Bob. Wow, the memories flooded in! Especially Ginger Man. How can I copy this to my iTunes account, anyone? Must I call the geek squad? Not sure if I should share my Bank stories…BUT I WANT TO! Am I mistaken or didn’t they put horns in in NY? Now I’m on a mission to find this albumn, and my poncho. I have a copy of this album with the open door safe cover. Steve Sellars 816 718 1415. IMHO, the demo is better that the released record. Yes there are horns, but the band didn’t have a choice. Lots of copies of the Command LP available on ebay…. These are wonderful recordings of MNNB! Glenn Walters is my cousin. I got to see the band perform in K.C. in ’68 when I was 14. I have their LP, but have never heard these recordings. These are fantastic quality. Thank you so much for making them available. We used to see them in Westport in ’67 or ’68.They were great!!! !Remember Ed Toler who played guitar?We lived next door to Brewer and Shipley-Kenny Maple[Byrne]was great friends with them.I lived with Kenny’s half brother Patrick Byrne in a couple of places then[that was before he worked with Fleetwood Mac].Great days. Of course. I loved Ed. He was one guy who always let you know how he felt. Called everyone SCRO for scrotum or RODE for rodent. And man could he play the blues. Maple – yes I remember him. He hung out at the Chet Nichols sessions. Didn’t see him much on the 2 Brewer and Shipley projects though. I have photos of both of those guys. THE PLACE in westport can be seen in the street photos of the band in the player. The illustration above is from a photograph shot at an event called the “Kansas City Youth Festival” and I believe the year was 1968 or 69. The Mystic Number National Bank as shown, were there playing a promo spot at the Quigley Music booth. The festival was held at the site of the old American Royal. The highlight of the event was an appearance by the Steve Miller Band and it was memorable for Miller making some sharply pointed remarks about the Vietnam War and the concert business, exploiting performers and audiences. 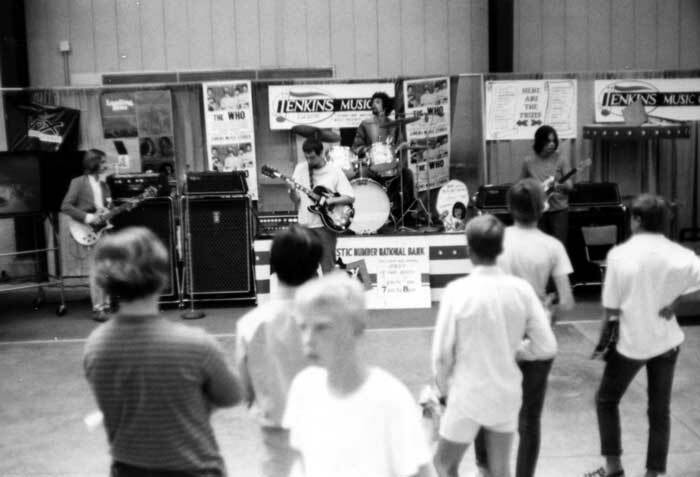 Many local bands appeared during the two day event, Besides the Bank, The Chessman Square were also featured. I recall the Strawberry Alarm Clock performed as well. I was startled when I first saw the picture above because I was there setting up to play across the hall just behind where the photographer would have been standing and watching the band play. I remember spending most nights in 1968 and 1969 hanging out at “The Place” in Westport. Love listening to MNNB and The Burlington Express. Being a drummer myself and doing some local band stuff I remember Glen Walters letting me sit in on drums in his place while he sang. Bob Sebbo used to amaze me on guitar. I still pull out the old LP once in awhile to listen to. Great Memories. I was born in 68. I live in Prairie Village. I’ve got cash in my pocket. I wanna buy this stuff right now. Which way do I run? Seriously, I’m at Roe & 69th right now. All this reminds me how much this Place..these people..this City..these times were such a strobe lit.. coming of Age story it would make a movie worthy of the genere! Hell I can still smell the PLACE!